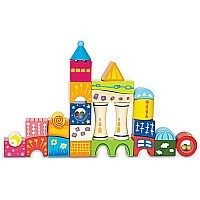 Create big, beautiful castles and buildings with Fantasia Castle Blocks. Colorful, shaped blocks inspire building while developing social skills, self-discovery, problem solving and physical skills. Sustainable wood with water-based paints. It’s perfect for princes and princesses. For ages 2-5 yrs.